This is the first post in a series of posts about what I think to be most relevant for 3DH from the IEEE VIS2016 conference in Baltimore. The poetry scholar Katherine Coles gave a presentation on Poemage at the VIS4DH workshop at VIS2016. 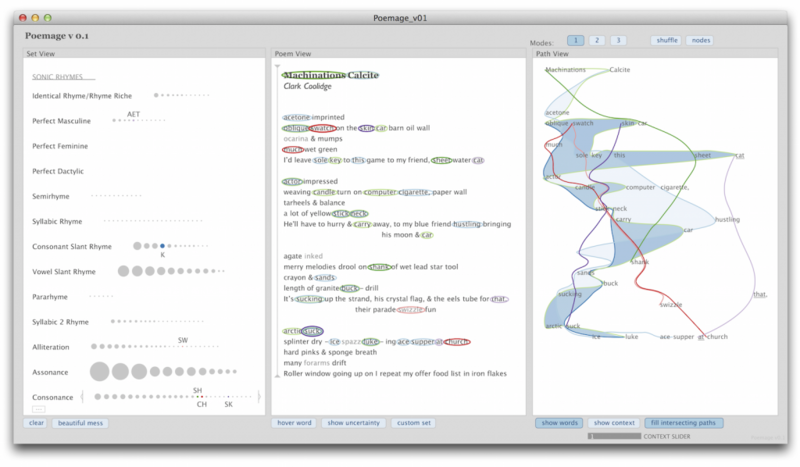 Poemage is a tool for exploring and analysing the sound topology of a poem. It is an interdisciplinary work between poetry scholars, computer scientists and linguists. Recommended reading is not only the presented paper Show ambiguity, which takes a more poetry scholar influenced perspective on Poemage but also the companion paper which complements “Show ambiguity” by adding the computer scientist stance to it. Besides the methodological principles that are covered by Poemage both papers give also great insight into the collaborative aspects of the project across disciplines. The UI of Poemage offers three views. The Set View offers rhyme sets, which are sets of words that are connected by a specific rhyme scheme. The rhyme sets are organized by rhyme types. Each circle represents a specific rhyme set. The size of the circle depends on the number of words in the set. The Poem View shows the poem in its original form and the Path View gives a 2D space where the flow of the poem according to its rhyme topology is displayed. Each node in the path view represents a word in the poem and is positioned in relation to its position in the layout of the poem. The curves show the flow of a rhyme set through the poem. 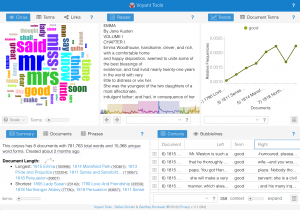 The views are linked by color coding and by interaction: e. g. selecting a rhyme set in the Set View also activates the visualization of that rhyme set in the other two views. I like especially the openness of the tool. It supports and encourages multiple readings and the rhyme types are extensible in two ways. The simple way allows the scholar to group words freely to form custom sets without being bound to any predefined rhyme type. The more complex way allows the scholar to access the underlying rules engine or formalism to formulate new rhyme types in a notation which is geared to poetry scholars. The representation of rhyme sets as paths allows exploration of the rhyme topology by examining spatial phenomena of the paths like intersections, mergings and divisions. There is a tight link between the visualisation and the poem that makes it easy to trace back observations in the visualization to the original data. Another interesting aspect of her talk was when Coles shared her view on the humanistic idiosyncrasies of data visualization, especially in poetry scholarship. She wanted Poemage “to provide an aesthetically enriched experience” and emphasized the engagement between scholar and object of study which should extend to the visualization as well. When we discussed the special needs for the humanities for visualization in the 3DH project so far, I (with a computer science background) was very sceptical about seeing the humanities on one side and the hard sciences on the other side. On the contrary I can see a lot of common ground between a physicist and a humanities scholar exploring and interpreting his or her data with visualizations. Instead of seeing the two as opposites we in 3DH started to work with a methodological continuum between the poles of subjectivity/uniqueness/particularity and objectivity/reproducibility/universality. I doubt that the kind of engagement Coles describes is the same engagement between a physicist and his or her data. I think Coles managed to describe at least part of the possible contribution of visualisation to one extreme of that continuum. And this really helps to track down the methodological differences 3DH visualizations need to account for.